Fortrose lies between Avoch and Rosemarkie on the A832 on the southern coast of the Black Isle. Many of the buildings are of an ornate Victorian style, evidence that it was during this historical period that it went through a rapid period of expansion. However, other buildings are evidence of a much older history. 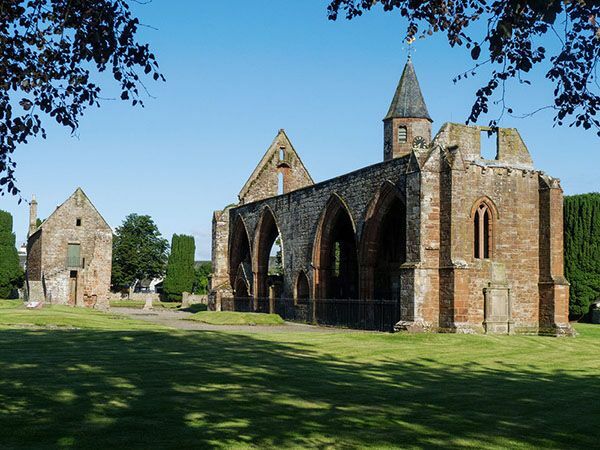 Just to the seaward side of the High Street is Fortrose Cathedral.It was built in 1250 A.D., and though only a fraction of the original building remains standing, it is an impressive sight. It is constructed of red sandstone with a spire at one end. It stands within four walls, surrounded by mossy lawns, and there is a large free parking area around the walls. Every year, a mediaeval fair, St. Boniface's Fair where all participants wear mediaeval costume, is held in this square with the Cathedral as a centrpiece. There are craft and produce stalls, jugglers and tumblers, and traditional music. Near the Cathedral is the town hall which houses some impressive paintings. Nowadays Fortrose is the academy town for most of the Black Isle, and the majority of Black Isle secondary school pupils go there. The old school building has been added to over the years, but the older part is easily distinguished and is a very attractive building. Behind the school is a grassed walkway called "Greengates" which takes you on a gentle walk through fields towards Chanonry point. Hidden from most of the town and only reachable by narrow, twisting roads, is a very pretty harbour and a peaceful and secluded beach. The harbour is largely given over to leisure pursuits these days--there is a very active yacht club in the town. At the extreme eastern end of the High Street, just beyond the Church of Scotland church, another interesting building with its unusual spire, is the hill road to Raddery. This road takes you up a steep hill through farmland and woodland, and affords you spectacular views from the top. After a winding descent on the other side, the road deposits you beyond Rosemarkie, at the top of the Fairy Glen. Shared with Rosemarkie, the Chanonry Golf Club lies on a V-shaped promontory of land which juts sharply into the sea. Fortrose and Rosemarkie are on its two corners. The Golf Club is over 100 years old, though golf has been played here for centuries. The point of the Chanonry is an ideal spot from which to see the famous Moray Firth dolphins, as they often feed and play in the shallows offshore. Two stone built ice-houses can also be seen on the golf course,remnants of the once thriving salmon fishing industry in the area. On a more sombre note, there is a memorial to the Brahan Seer on the links, on the spot where he was burnt to death in a tar-barrel. He was a local prophet and "witch" who was executed in this barbaric fashion in the 17th century. There are several tearooms and restaurants in Fortrose, And a selection of small shops. It also has a gym and leisure centre near the school.